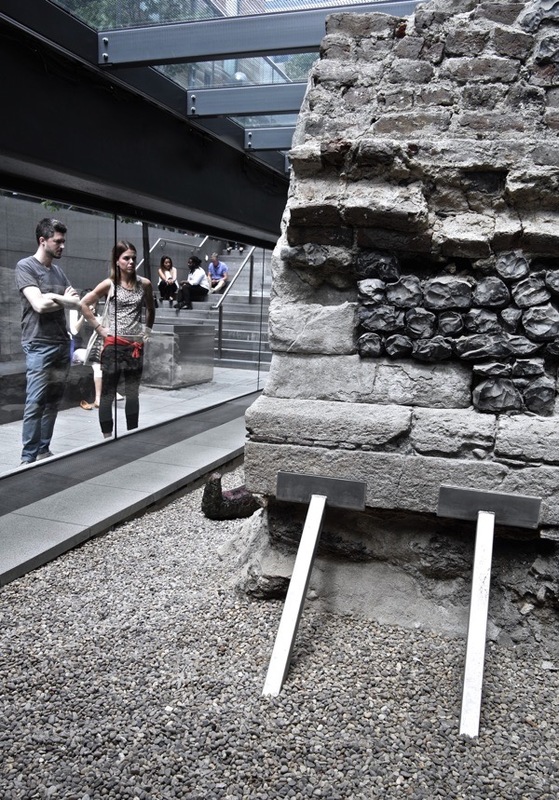 I wonder if those who work in the corporate financial industries in Bishop’s Sq today ever cast their eyes down to the cavernous medieval Charnel House of c. 1320 beneath their feet, once used to store the dis-articulated bones of many thousands of those who died here of the Great Famine in the thirteenth century. 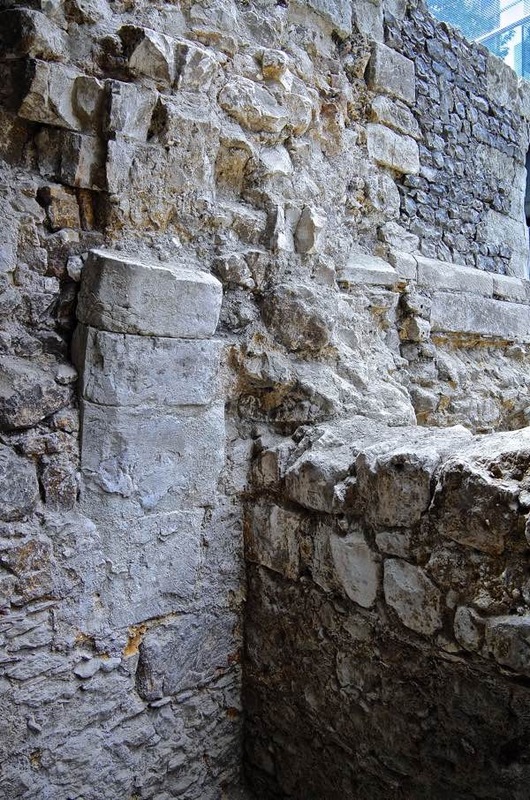 Inspector of Ancient Monuments, Jane Siddell, believes starving people flooded into London from Essex seeking food after successive crop failures and reached the Priory of St Mary Spital where they died of hunger and were buried here. It was a dark vision of apocalyptic proportions on such a bright day, yet I held it in in mind yesterday as we descended beneath the contemporary building to the stone chapel below. 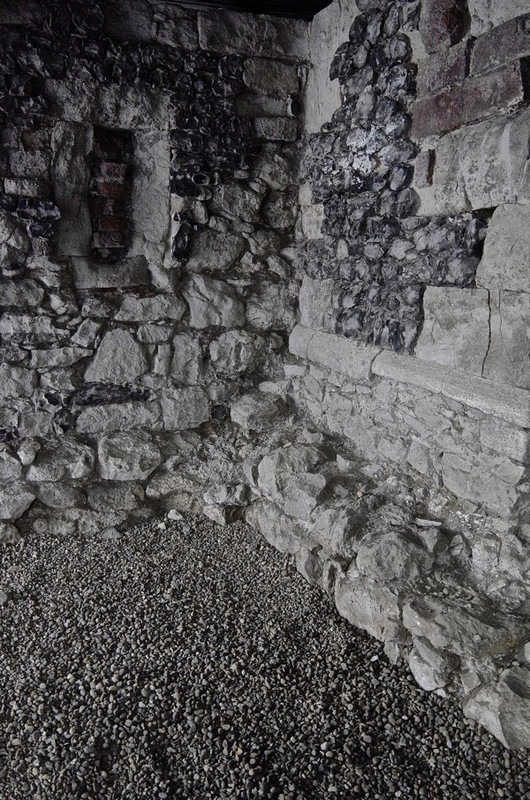 At first, you notice the knapped flints set into the wall as a decorative device, like those at Southwark Cathedral and St Bartholomew the Great. London does not have its own stone and Jane pointed out the different varieties within the masonry and their origins, indicating that this building was a sophisticated and expensive piece of construction subsidised by wealthy benefactors. 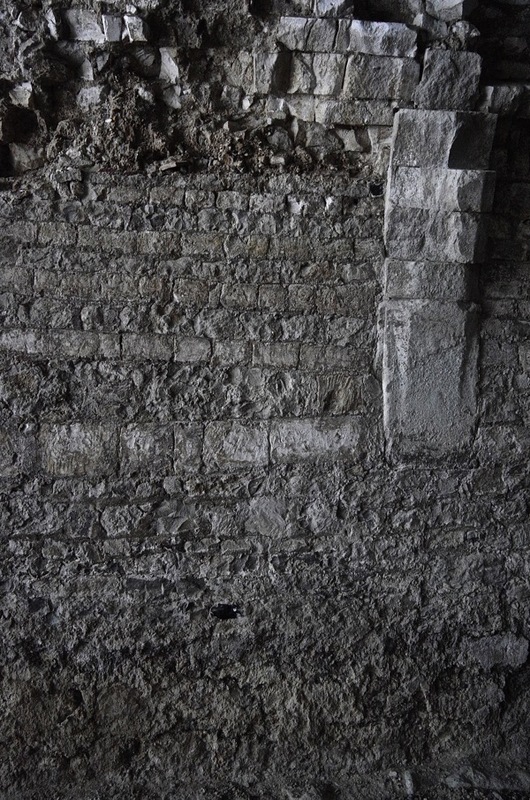 A line of small windows admitted light and air to the Charnel House below, and low walls that contain them survive which would once have extended up to the full height of the chapel. 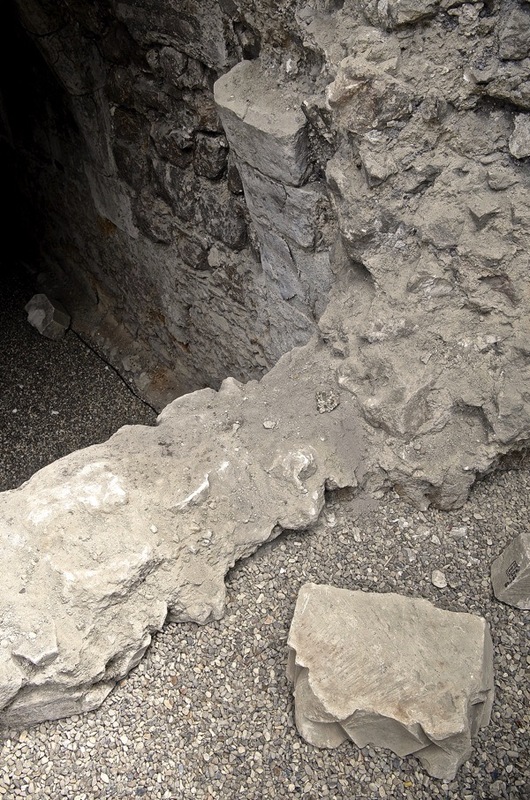 When you stand down in the cool of the Charnel House, several metres below modern ground level, and survey the neatly-faced stone walls and the finely-carved buttresses, it is not difficult to complete the vault over your head and imagine the chapel above. Behind you are the footings of the steps that led down and there is an immediate sense of familiarity conveyed by the human proportion and architectural detailing, as if you had just descended the staircase into it. 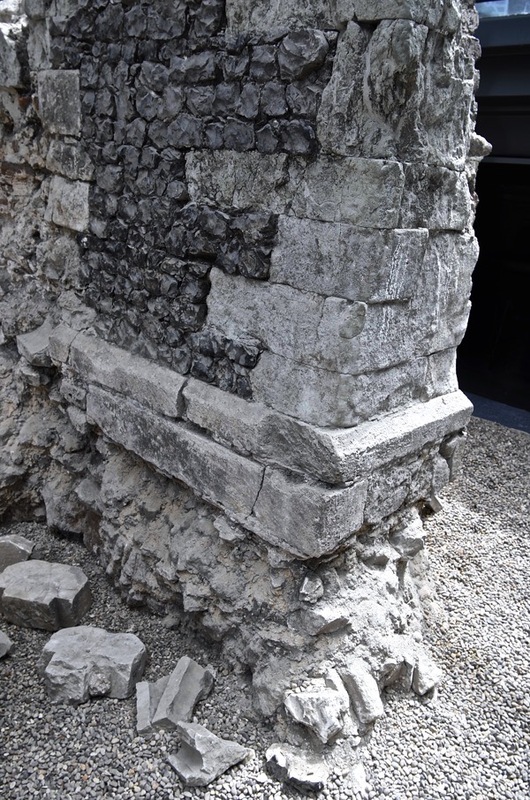 This entire space would once have been packed with bones, in particular skulls and leg bones – which we recognise in the symbol of the skull & crossbones – the essential parts to be preserved so that the dead might be able to walk and talk when they were resurrected on Judgement Day. Yet they were rudely expelled and disposed of piecemeal at the Reformation when the Priory of St Mary Spital was dissolved in 1540. 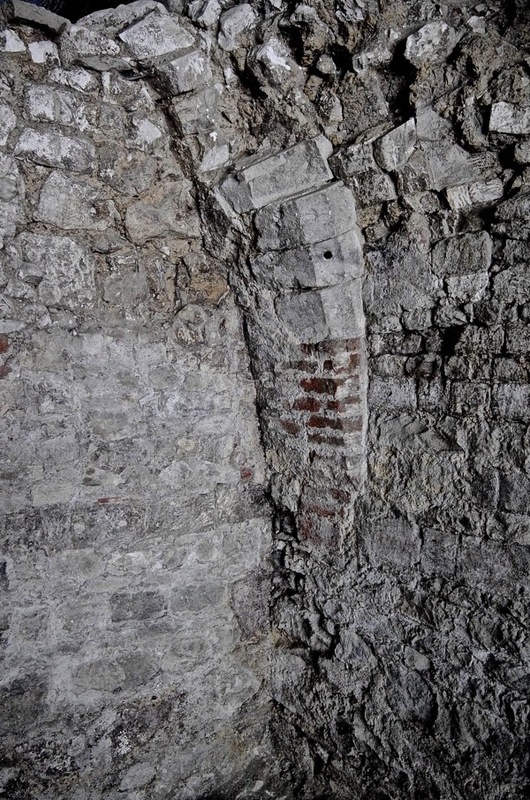 Brick work and the remains of a beaten earth floor indicate that the Charnel House may have become a storeroom and basement kitchen for a dwelling above in the sixteenth century. 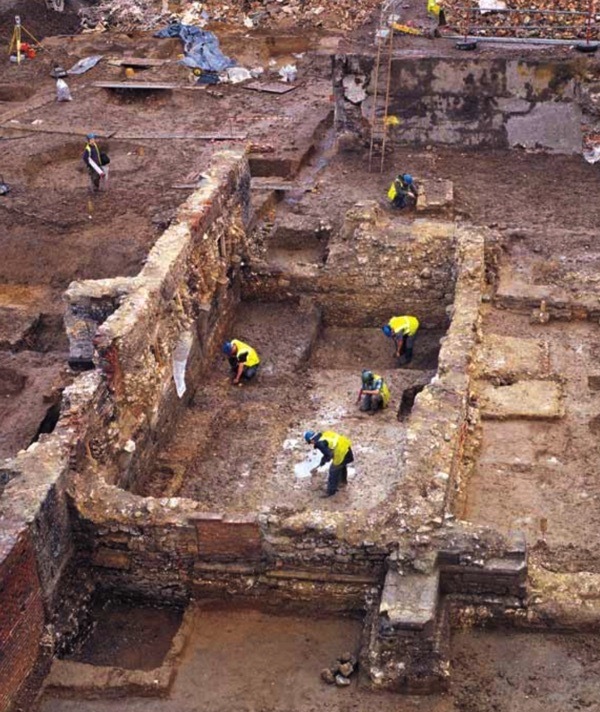 Later, it was filled with rubble from the Fire of London and levelled-off as houses were built across Spitalfields in the eighteenth century. 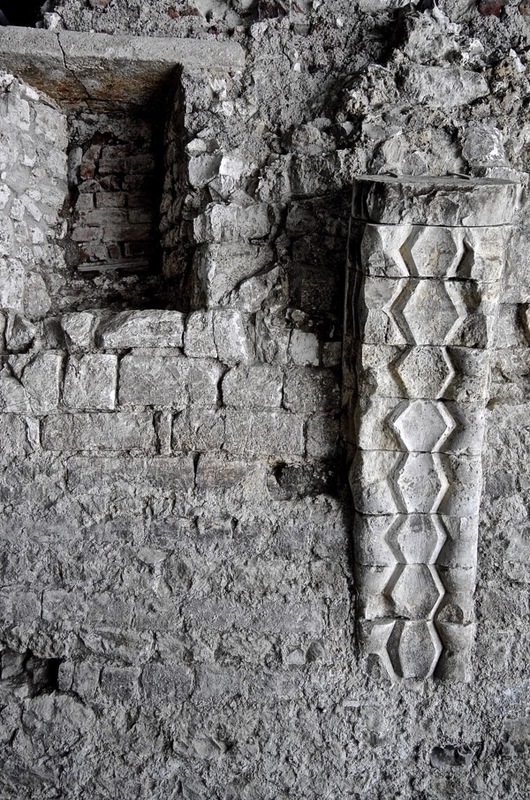 Thus the Charnel House lay forgotten and undisturbed as a rare survival of fourteenth century architecture, until 1999 when it was unexpectedly discovered by the builders constructing the current office block. Yet it might have been lost then if the developers had not – showing unexpected grace – reconfigured their building in order to let it stand. 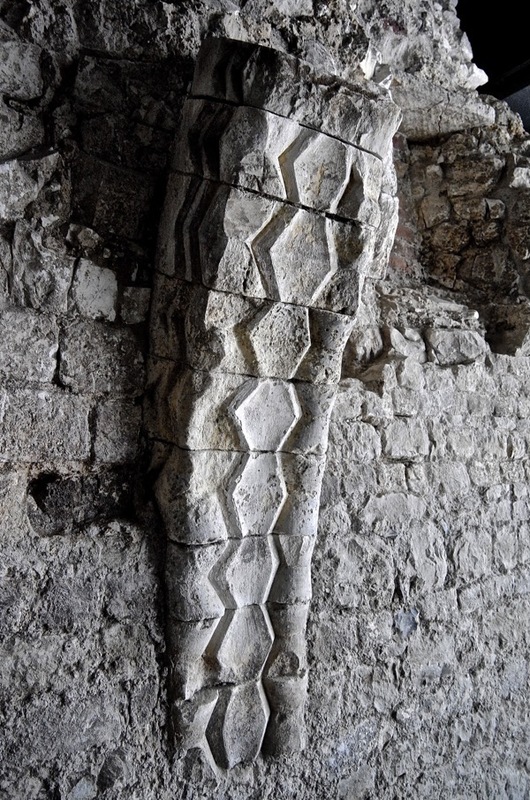 Twelfth century denticulated Romanesque buttress brought from an earlier building and installed in the Charnel House c.1320 – traces of red and black paint were discovered upon this. Absolutely fascinating, thank you for posting this. Wonderful blog Gentle Author, most interesting. What a fascinating place Spitalfields is. i read with great interest today’s article….who would have guessed so much history right under our noses? Great to know that this has been preserved so well, other developers please take note!! 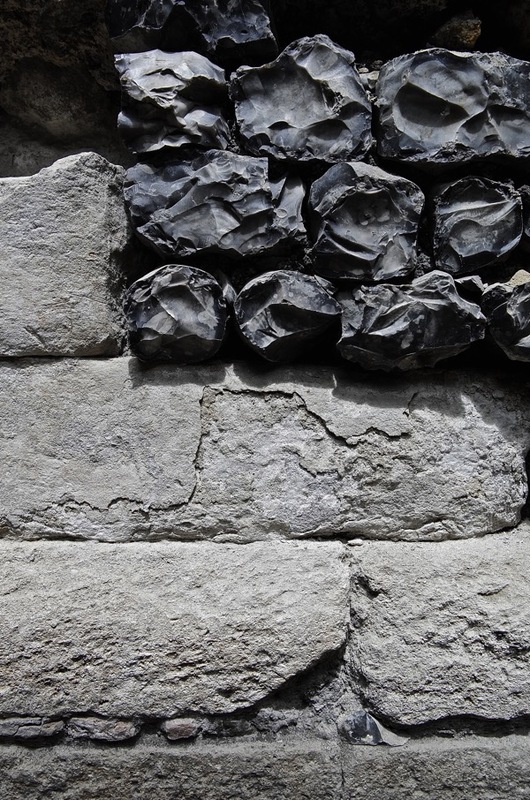 And thank you for giving us a chance to see the photos with flint knapping that is so reminiscent of Norfolk. 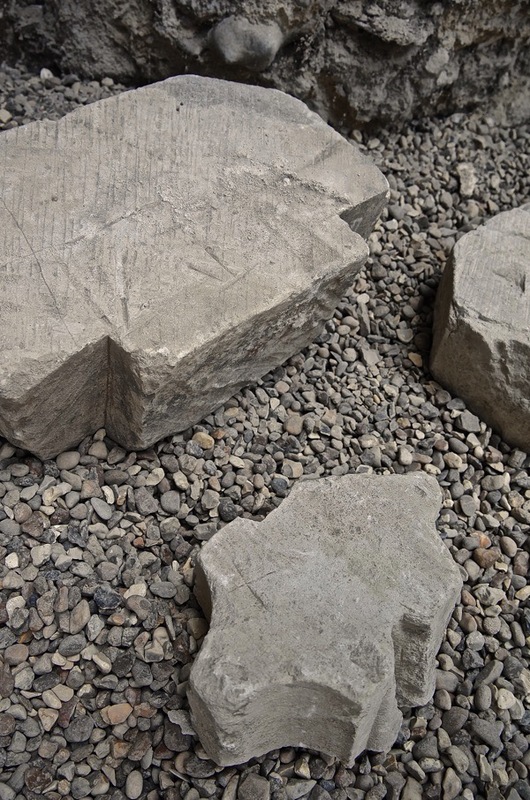 What lovely stonework (and photos). I t reminds me of a Cornelia Parker piece. 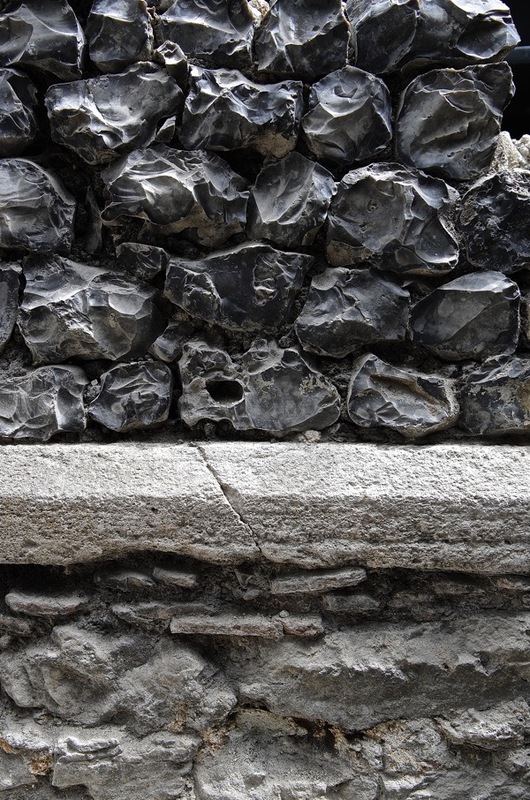 Beautiful studies of the textures of knapped flints – Whole photo set has a great style and tonality. On whom should we be heaping our praise? Yes, lovely pics, and very informative. 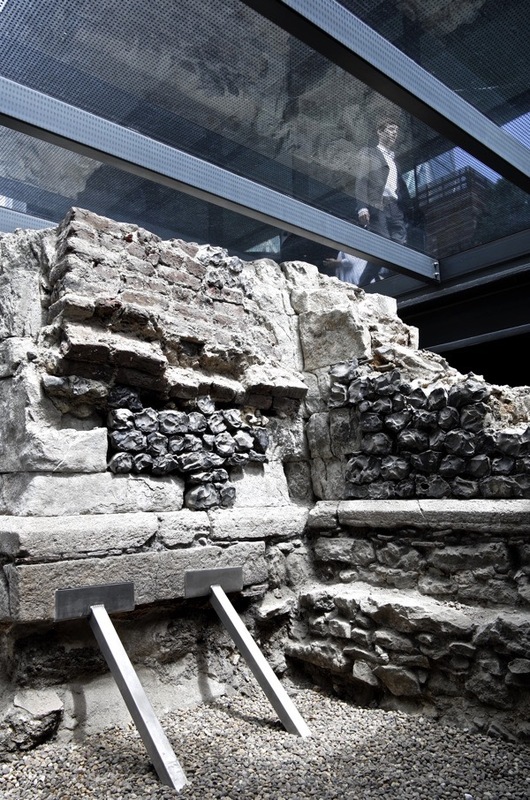 But I have for some time been abit puzzled about this building, regularly referred to as a `charnel house’ as if that was what it had been built as. But surely this is not the case? 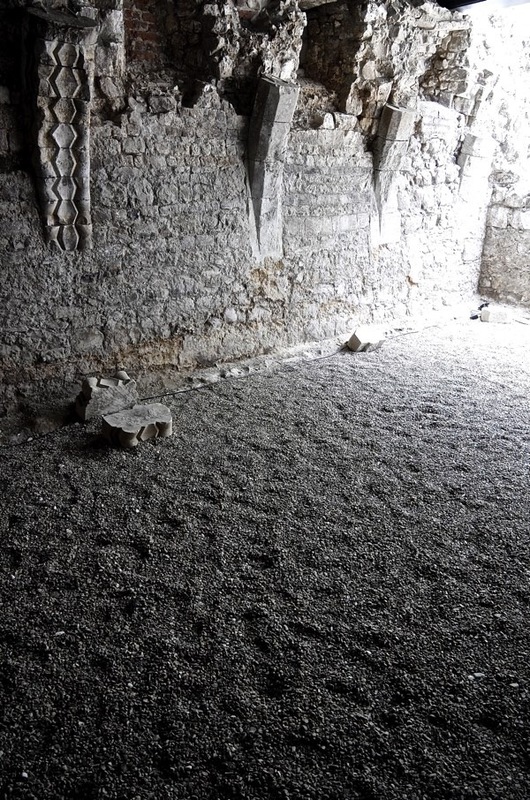 I don’t doubt that bodies may have been piled into it during the mid-fourteenth century hunger that followed on a succession of bad harvests (something that is itself confused with the Black Death) but I think it was built simply as a chapel. The care taken with the vaulting, the re-use of old, decorative stones and the traces of coloured work on them all point to something grander than just a body-store. 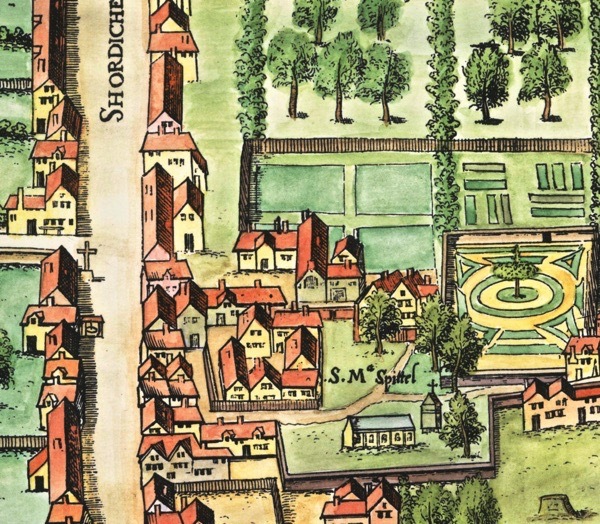 The level at which it stands was, in the middle ages, the ordinary ground-level – as is suggested by the little contemporary picture of it, included in the blog, which shows an above-ground building with windows. 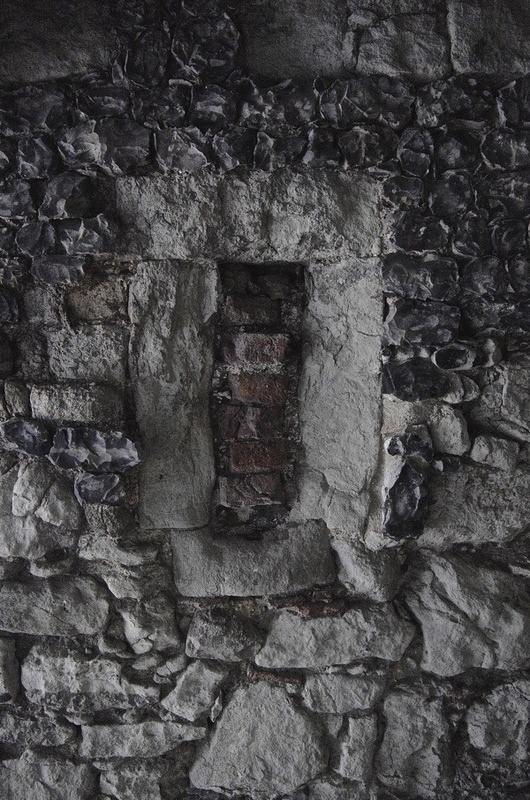 These windows, indeed, were not blocked till two centuries later, when the Reformation overtook the whole place. By that time, presumably, with demoliton and new buildings, the land-level was rising, and was to rise still more when debris from the Fire of London was piled onto the Spitalfields.